Hi! Today I'm back with the next 26 Great Nail Art Ideas prompt, 'Dotting Tools, But Not Just Dots'. If you missed my post for 'The End of Summer' theme, you can find that here. For dotting tools, the first thing I think of (except dots) is flowers! 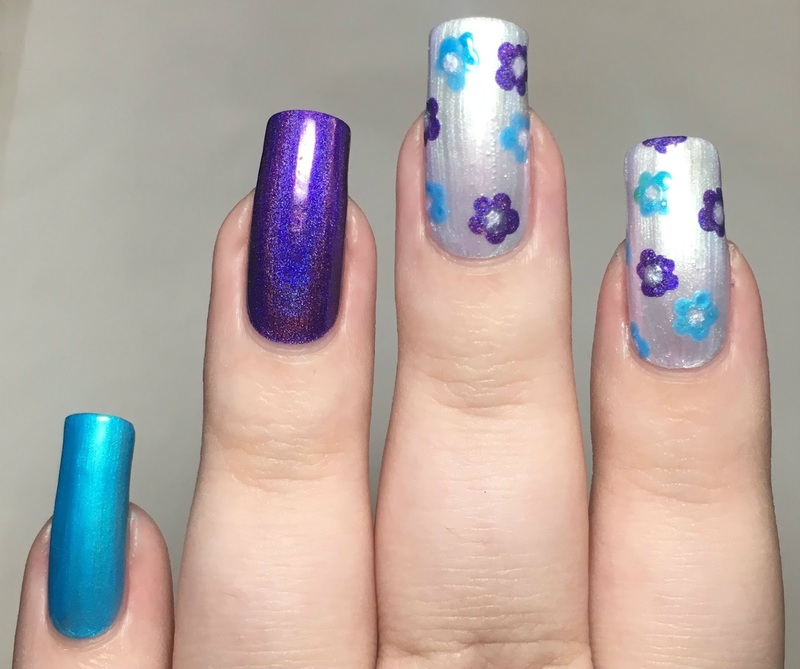 I also still needed to do my nail art for August's MeeBox, so combined the two to create my below look. Read on for more info! I started by painting my pointer and middle nail with True Brit London 'Etiquette', ring nail with 'Ard As Nails 'I Love You Hunny Bunny', and pinky nail with Color Club 'Pure Energy'. 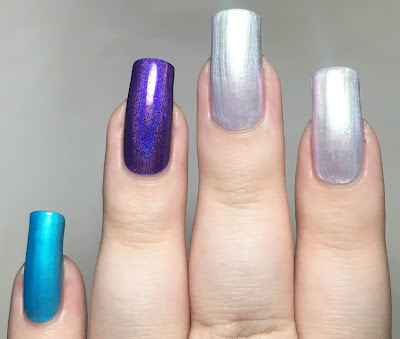 All three polishes were from August's MeeBox - you can find my full swatches here. I then added my dotting tool flowers. I used the 'Ard As Nails and Color Club polishes and created small circles of dots on my nails. I then added a dot of the True Brit London in the middle of each for the flowers centres. As a final touch, I added a skull decal to my middle nail. 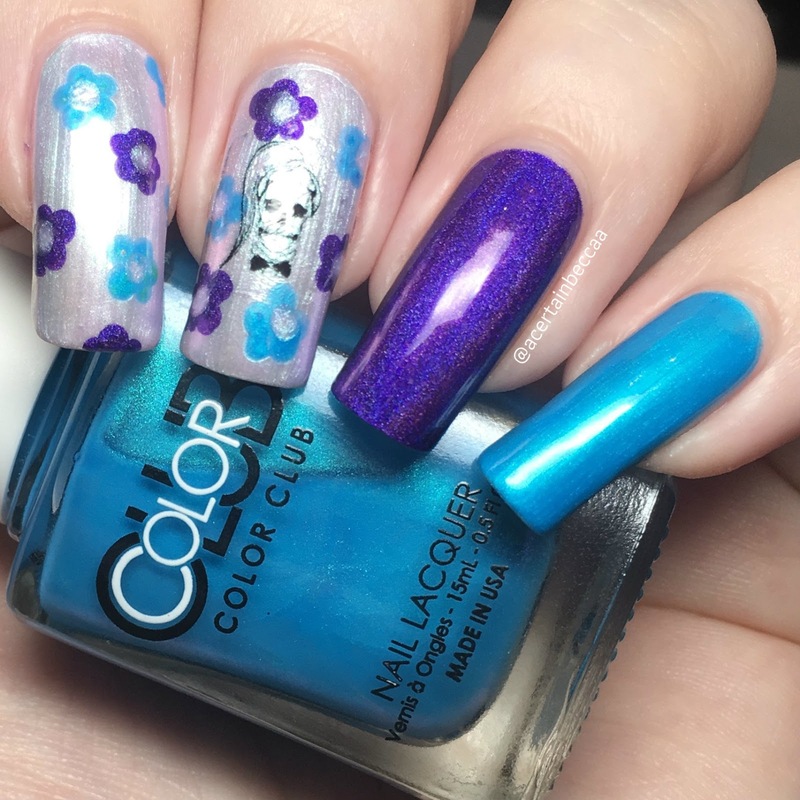 I used a Lady GaGa skull from the Rockin' Claws (House of Wonderland) sheet of 'Born This Way' water decals, again from August's MeeBox. I simply cut out my chosen skull and soaked it in water, before sliding it off the backing and placing it onto my nail. What do you think? I actually quite like them, skulls and flowers always look great together! I also think it works well for both the 26 Great Nail Art Ideas theme and the MeeBox theme. I found it fun combining the two together. The colours are great together, and I really need to take inspiration and use dotting tool flowers more often!